For sanitizing medical facilities. Destroys virus, bacteria, and bio-contaminants. 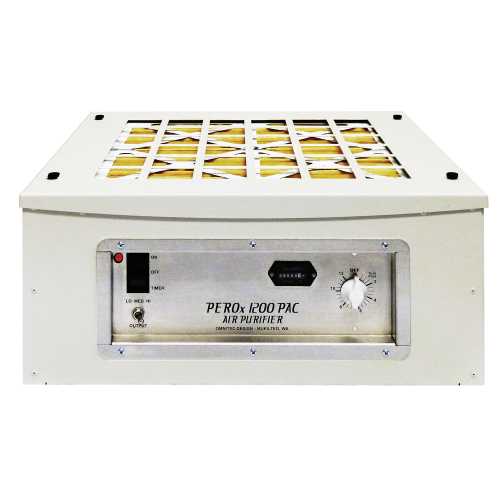 The PEROx 1200 PAC module attaches directly to the exhaust end of the OmniAire 1200 PAC portable HEPA air cleaners. Depending on size of the space treated, duration and required level of sanitation required, the PEROx offers LOW/MED/HIGH levels of IHP output. The LOW output is used in small and medium sized, as well as occupied rooms. HIGH output setting is used for sanitizing hospital rooms before and after occupancy for maximum bio-contaminant and microbial control. The PEROx 1200 PAC module utilizes an Ionized Oxidation processes to effectively destroy a wide range of harmful pathogens such as MRSA, SARS viruses, strong odors, VOCs and other bio-contaminants. Oxides are generated from moisture and oxygen in the environment and unused oxides convert back to O2 and H2O leaving zero chemical contaminants. 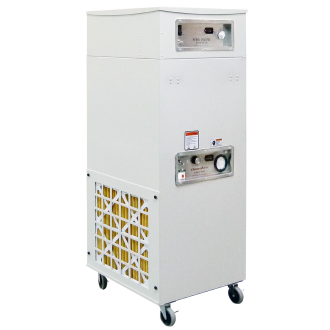 PEROx air modules can safely and effectively sanitize the air and surrounding hard surfaces in critical care environments, such as hospitals, labs, or nursing homes. PEROx 1200 PAC module for OmniAire 1200 PAC portable air cleaner machines are designed for use in hospital and medical environments or where there is a risk of bio-contaminants such as virus are a concern. The combination of a medical grade 99.99% HEPA filter and UV Germicidal-Irradiation included in OmniAire PAC machines with optional PEROx ionic oxidation modules offer the highest level of protection for both healthcare professionals and patients. We at are concerned with providing the highest levels of protection for hospital workers and patients. After hospital cleaning staff carry out infectious disease control cleanup procedures (the removal of all physical items) in the infected areas, hospital rooms and healthcare facilities can then be put back in service faster if the air is purified with a PEROx 1200 PAC air purifier module. This results in minimal room shut down and disruption, which is a major concern for all hospital administrations.